I know it's a different Earth. I know the personalities are wildly different. But people ... this book has Wesley Dodds on the page, whole and hearty. Who can refuse a book that brings back Wesley Dodds? 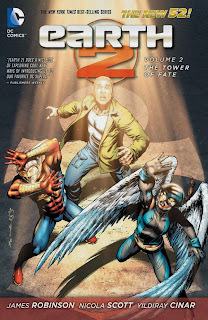 James Robinson's Earth 2 Vol. 2: The Tower of Fate really only moves the Earth 2 story forward by inches. If, like me, you're simply agog at the new takes on Wesley Dobbs, Al Pratt, Lee Travis, Jason Wing, Red Tornado, and the rest, then the thin plot ought not bother you too much (except to make you eager for the next volume). If playing "spot the obscure DC Comics reference" isn't your thing, however, you shouldn't be watching Arrow you may find yourself wishing Robinson would pick up the pace a little (though unfortunately that would only hasten his departure from the series). Most of this volume involves the second origin of the new Doctor Fate -- the second origin because, through a series of events probably more convoluted than they needed to be, Khalid Ben-Hassin has already been Fate once, refused the power, and now he's on his way to becoming Fate again. Perhaps because Khalid is Earth 2's first brand new character to take on an established character's mantle, Robinson devotes four issues to his development, mostly setting aside the rest of Earth 2's cast. I wouldn't have minded the slow build if other things were going on at the same time or if more of the cast had been involved in the Fate story. As it was, it's obvious to all involved from the beginning that Khalid would become Fate again and defeat the book's villain du jour, Wotan, so there was a lack of suspense in, essentially, a story we've read a dozen times before. Robinson offers a couple of surprises, including why Khalid is "Doctor" Fate and also Khalid's connection to a more familiar Fate-related character, but these were not enough to make up for the relative lack of screen-time that Green Lantern, Hawkgirl, and others have in this volume. At the same time, Robinson is somewhat famous for the slow build, crafting plotlines over years in Starman as well as interrupting the flow with the "Times Past" stories. Tower of Fate includes another such example, in a chapter where Robinson leaves behind all the heroes entirely and focuses instead on Apokoliptian villain Steppenwolf and his protege, the new Fury. I perhaps didn't like so much the spotlight on Steppenwolf -- in the light of day, he's a less scary presence than he was before -- but I appreciate the point Robinson makes here, that the series is Earth 2 and so all the players are of equal importance, heroes and villains. Mostly I'm curious to see where Robinson takes Earth 2 next. That's tinged with sadness, of course, since Robinson leaves the book with issue #16, which will fall in the middle of the next collection, Earth 2 Vol. 3: Battle Cry (no longer "War," probably because of the Wonder Woman collection by the same name). The upcoming fight with Steppenwolf is one thing -- though there's so many references here to an evil greater than Steppenwolf that I have to imagine the battle against Steppenwolf still won't be the main event -- but also this volume teases the return of Mister Miracle and Big Barda, too. It's almost as much a relief to see them as it is Wesley Dodds -- even if these aren't the exact same characters, many of them were so much maligned toward the end of the pre-Flashpoint DC Universe that there's joy in seeing them rejuvenated, back on the page. I have a theory that Scott Free and Barda aren't the only New Gods hiding in plain sight in Earth 2 (I won't spoil it but contact me if you want to hear more). That Earth 2 has Mister Miracle and Brian Azzarello's Wonder Woman has Orion would seem to make the two titles rife for a crossover, though Azzarello's title remains largely disconnected from the rest of the DC Universe -- strangely so, considering that the presence of the New Gods might make Wonder Woman a central DC Universe book. One day the Justice League will have to rematch with Darkseid, and one day the Earth 2 characters will have to meet the "Earth 1" characters, and I'd be very pleased if this was a well-organized event that encompassed these various storylines from a variety of titles. Next week -- we'll stick with James Robinson for a bit with his Vandal Savage story in DC Universe Presents Vol. 2. See you then!